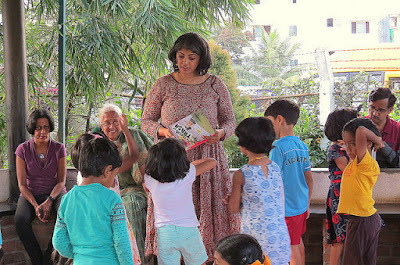 For the last seven years Pratham Books has been conducting 'One Day, One Story', an annual storytelling campaign that celebrates International Literacy Day on 8th September every year. 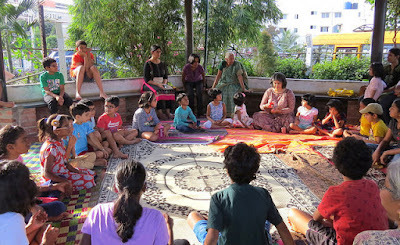 PNLIT has been part of this campaign for the last five years! This year the selected book was A Cloud of Trash written by Karanjeet Kaur and illustrated by Bhavana Vipparthi. 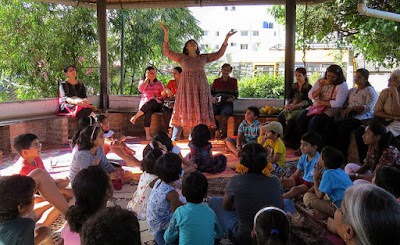 Theatre practitioner and filmmaker Surabhi Herur narrated and enacted this story much to the joy of 25 young children and their parents and grandparents who had assembled at the lake. 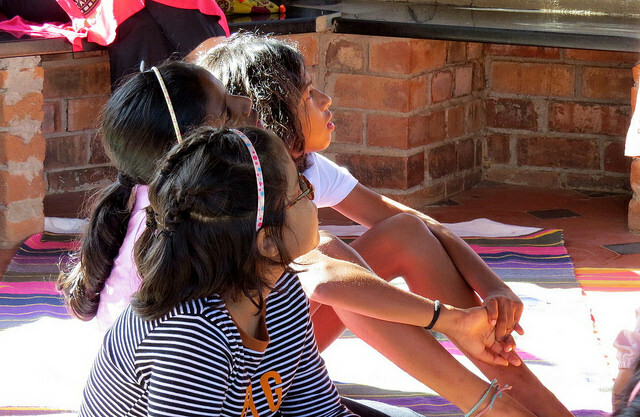 Who doesn't like a good story? 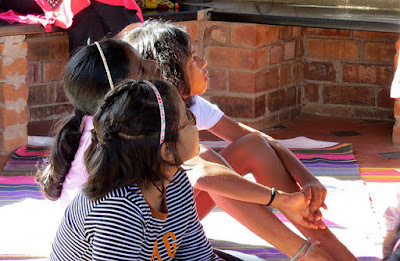 The young to the elderly love to hear a well-told tale. 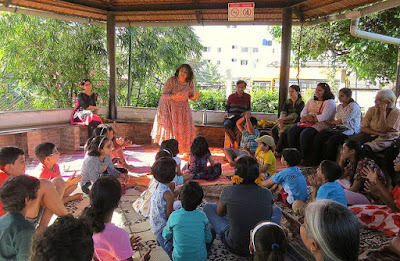 The story telling session had young children enraptured with a modern tale about an everyday problem - garbage. 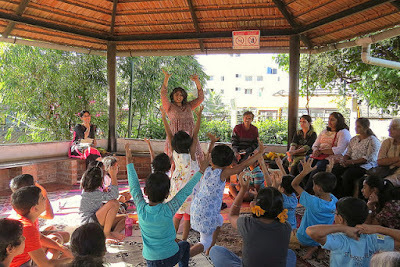 Recited with flair, vigour and vivacity, by theatre savvy, Surabhi Herur, the session had the children intellectually, emotionally and physically engaged at every stage, to explore an existential problem and together find solutions for it. A Cloud of Trash tells the story of a young girl with a burdensome cloud of garbage floating above her head at every moment. And that is the worrisome story of our cities today which has to be told to our young ones. Surabhi brought the engaging session to a close with a collective,symbolic pledge to keep our environment clean. 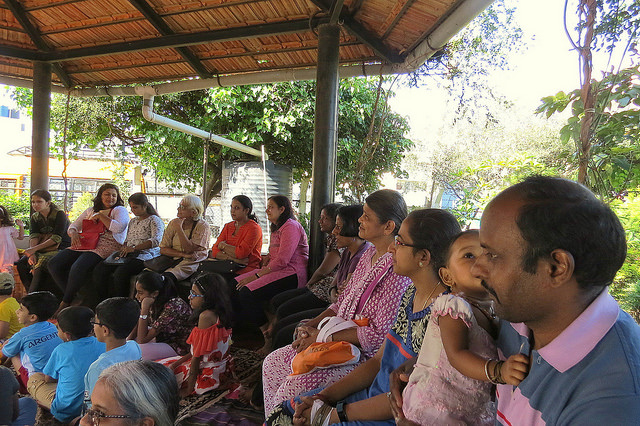 Here are some moments captured beautifully by Vishnupriya Hathwar and Deepa Mohan.